Larne is one of three finalists in the running for an award from the Alzheimer’s Society. The town was nominated in the Community of the Year category as part of this year’s Dementia Friendly awards. The accolade recognises villages, towns, and cities leading the way in taking action to ensure that people living with dementia are included in their community. Dementia Friendly Larne has been developed as part of the Mid and East Antrim community planning process. There is a friendship group meeting held monthly where activities and befriending services are provided. There have been regular dementia friends workshops held for individuals and businesses in the area. There are currently 98 dementia friends in Larne and 42 businesses proudly display the dementia friendly sign on their windows. In their application form, Dementia Friendly Larne said: “We aim to raise awareness and also to encourage the entire community to share in the responsibility for ensuring that people with dementia feel understood, valued and able to contribute to their community. By 2021, one million people will be living with dementia. The Alzheimer’s Society Dementia Friendly awards 2017 unites communities and individuals across the UK to recognise, celebrate and promote the inspirational achievements of those making a real difference to people living with dementia. 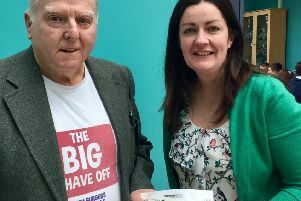 Alzheimer’s Society Director of Northern Ireland, Bernadine McCrory, said: “I am delighted that Larne community has been selected and this is evidence of the brilliant dementia friendly work going on there. This year there are 12 awards across 10 categories, with awards for Dementia Friendly Organisation, Community, Partnership, Dementia Friends Champion, Innovation, Young person’s contribution and Inspiring Individual, as well as a brand new categories to celebrate individual and group fundraiser of the year, and journalist of the year. Winners will be announced at the Awards ceremonies taking place in Europa Hotel, Belfast, on Tuesday, 28 November, where Alzheimer’s Society Ambassador Sarah Travers will conduct the ceremony.